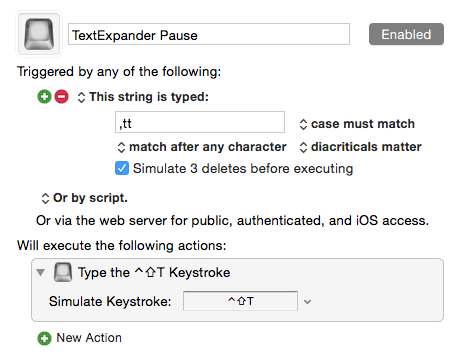 I like using a string trigger to temporarily pause TextExpander. This way, I can type trigger the pause, type a word, and then type again to enable TextExpander. I’m liking this idea by Bakari Chavanu, but I don’t want to set one more global keystroke, so I quickly wrote this AppleScript to toggle snippet expansion from this script.